To save your time from recreating Mac OS X’s drop shadow setting from scratch in Photoshop, here’s style set you can download and double-click on file to install into Photoshop’s Style palette window. Pick a layer you want to apply this style to and click a style in Style palette window. 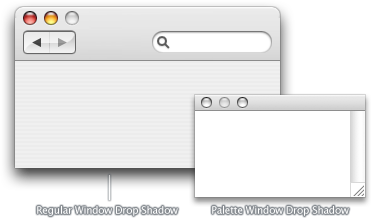 The settings are 98% accurate to Mac OS X’s drop shadow. How did you figure out that they’re 98% accurate? Pingback from myFeedz - Articles on "mac os x"
That’s top – I’ve never been able to get the drop shadow just right… the sides and bottom of the shadow are easy to do but it’s impossible to get the mac style couple of pixels at the top as well. I always resorted to using a gradient overlay with a very extreme cut-off point so the top is effectively stroked but the rest is left as is – it never occurred to me to use an outer glow to achieve this! This is brilliant! I’ve always been annoyed by the fact the cmd-shift-4 space doesn’t include the drop shadow for the window you’re taking a photo of, making it… pretty useless. With this, the problem is solved! Thanks! does not load a new style in styles ?!? great!! thanks for that ! I would love to know how to recreate the shadowing where it looks like the image is curled at the bottom edges, with shadowing underneath, but none in the middle. Very cool. Just used it for Santa’s Gizmo 3 mockup =). Pingback from MacThemes Forum / Mac style shadows in photoshop? Pingback from MacThemes Forum / How do windows generate their shadows? Pingback from Photoshop ???????????? - WEB?????????? ?